Enquire about this tour Have a question? This amazing tour allows you to discover Russia’s rich and diverse historical and cultural heritage. You will see famous landmarks such as Red Square, the Kremlin, Tsar’s Winter Palace and St. Peter and Paul’s Fortress. This tour gives you plenty of free time to explore the cities at your leisure with the option of several additional excursions for you to choose from. The Tsar’s Winter Palace, Nevsky Prospekt, St. Isacc’s Cathedral and the Statue of Peter the Great feature on your guided tour. Explore St. Peter and Paul Fortress with your Local Specialist. Spend the rest of the day at leisure. Soak up the atmosphere, romance and lights of this former imperial capital, known as the “Venice of the North”. Board a private boat to cruise through the canals and along the River Neva. You’ll sip champagne as your Local Specialist provides commentary about the city that has inspired artists for generations. There may be an opportunity to attend a ballet performance in the historic atmosphere of a Tsarist era theatre. Subject to availability of tickets and performance. Price will vary from €80-€110, depending on the venue and the Ballet Company. Your Local Specialist will offer a guided tour of the interiors of two iconic churches. The Church of the Saviour on the Spilt Blood, built to commemorate the assassination of Tsar Alexander II, has one of the country’s most intricate displays of mosaic icons. Additionally, St Isaac’s Cathedral is the 4th-largest cathedral in the world. Designed by a French architect, its immense interior is comprised of malachite and other precious materials. A chance to attend one of the best Russian folklore programs in St. Petersburg. You’ll enjoy a high-energy performance featuring Cossack dances, songs, instruments and costumes from around Russia. During intermission, sample local champagne and vodka. An unforgettable experience! Experience a visit to one of the largest and most valuable collections of art in the world, all set in the splendour of the Winter Palace and its elaborate interiors. Enjoy a free day to explore the city further, or visit the State Hermitage Museum, one of the oldest and largest museums in the world containing over 3 million works of art and artefacts. On this full-day tour, your Local Specialist will take you to the villages of Pushkin and Petrodvorets, where you will visit Catherine’s Palace and Peterhof Gardens. Recently restored, Catherine’s Palace is most famous for the fabled and wholly unique Amber Room. Located on the Baltic, Peterhof Gardens are modeled after those at Versailles. Following a guided tour, you’ll have time to enjoy a stroll as you marvel at the gilded fountains. This optional involves reservation and entrance pre-payments. Cancellation within 24 hours will incur a 50% cancellation fee. This two-part tour pays tribute to Russia’s noble and royal families and provides an explanation for the collapse of the monarchy. You’ll see the opulent interior of Yusupov Palace, one of the grandest noble residences in the country, and learn about the plot to murder the mystic Rasputin. Then, visit the tombs of Tsar Nicholas II and his family at Peter and Paul’s Cathedral. This morning consider an Optional Experience to the summer residence of Peter the Great in Petrodvorets. 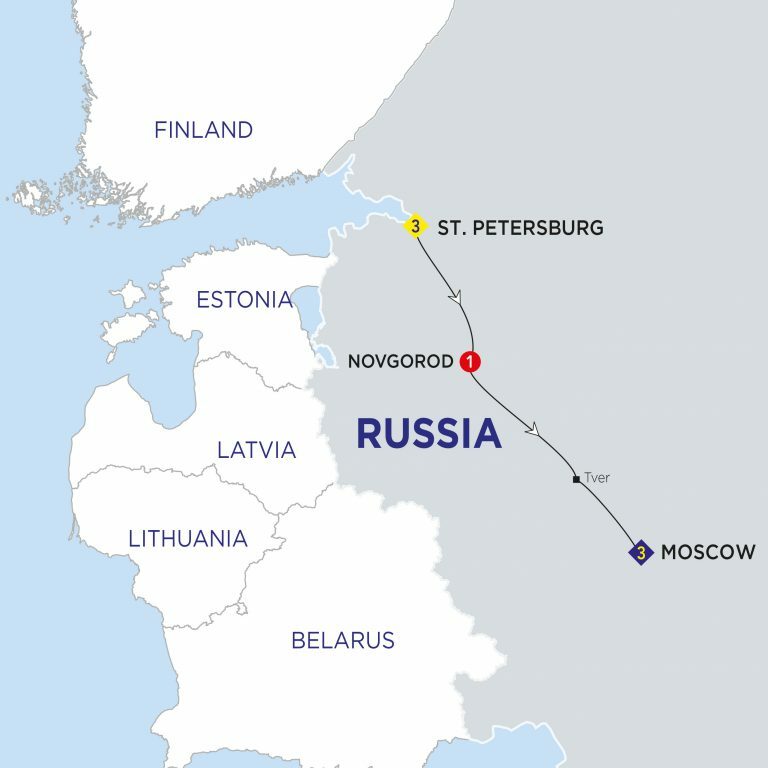 Afterwards, cross the vast Russian plains to the ancient city of Novgorod where you view the Kremlin Fort, Millennium Monument and St. Sophia Cathedral. Dine tonight at your hotel. Your journey continues through picturesque villages to the Tver region, where you stop for an included lunch. Travel via Klin, the former home of Tchaikovsky, to the Russian capital, Moscow. Often cited as the most beautiful subway system in the world, Moscow’s grandiose Metro stations are decorated with mosaics, stained glass and bronze statues. They’re also one of the few remaining places featuring Communist iconography. We’ll finish our guided visit with a walk through Red Square, where the evening illuminations should provide enviable photo opportunities. Moscow is a city full of wonderful buildings and monuments. Your Local Specialist shows you an array of sights including Red Square and the domed St. Basil’s Cathedral. In your free time perhaps visit the UNESCO World Heritage listed Kremlin, considered to be one of the greatest architectural complexes in the world. Or visit the impressive Treasure Chambers of the Tsars, full of unique collections including priceless Faberge eggs, resplendent Imperial carriages and Catherine the Great’s diamonds. Discover ancient cathedrals, the world’s largest cannon and the emperors’ bell. You’ll also visit the Cathedral of Christ the Saviour. Built on the site where the Soviet government dynamited the original Cathedral, it was funded by donations from millions of Muscovites. Finally we’ll take a stroll through the famous Arbat street. Once inhabited by the tsar’s artisans and equerries, often referred to as Moscow’s Montmartre, it’s lined with càfes, restaurants and shops selling local souvenirs. This optional involves reservation and entrance pre-payments. Cancellation within 24 hours will incur a 50% cancellation fee. You’ll have a opportunity to skip the queues and take a guided tour of the Treasure Chamber of the Russian Tsars – one of the most important museums in Russia due to its unique collection. You’ll see priceless Faberge eggs and Catherine the Great’s diamonds and many gowns. You’ll also discover the Imperial carriages, which are studded with precious stones and gold; coronation thrones; and other one-of-a-kind items from the Romanov Dynasty. This optional involves reservation and entrance pre-payments. Cancellation within 24 hours will incur a 50% cancellation fee. See the sights of your choice during your free day in the city. There will be the opportunity for you to consider taking an Optional Experience to Sergiyev Posad, the largest religious and cultural centre in Russia. Learn more about Russia’s military and contemporary history on this guided tour, led by your Local Specialist. We’ll visit the Borodino Panorama, home to a large-scale multi-sensory diorama. This moving work of art depicts the most decisive moment of the Battle of Borodino, which took place between Russia and Napoleon’s Grand Army in 1812. We’ll also walk through Victory Memorial Park to see impressive monuments to the victory in World War II. Finally, we’ll take a stroll through the famous Arbat street. Once inhabited by the tsar’s artisans, it’s now referred to as Moscow’s Montmartre, lined with càfes, restaurants and shops selling local souvenirs. 68 km from Moscow, Sergiyev Posad (known as Zagorsk in the Soviet era) is the centre of the Orthodox faith and Russia’s most important pilgrimage site. You’ll visit recently-renovated Troitse-Sergiieyeva Lavra, a working monastery, unique in the fact that it still operated during the atheist years of Communist rule. You’ll also have time to browse the markets, where you might like to buy locally-crafted lacquer boxes or Matryoshka dolls. This optional involves reservation and entrance pre-payments. Cancellation within 24 hours will incur a 50% cancellation fee. Say goodbye to this unique country at the end of your holiday. Airport transfers are available. Conditions apply. Breakfast is included on all overnight tours. Lunches are not included, unless otherwise stated. Evening meals are included when stated on the tour itinerary. On tours of seven days or more, generally fifty percent of dinners are included. Please check the itinerary page for exact details. Each UK trip will have a dedicated pick up point in central London. Shorter duration trips will normally depart from Victoria Coach Station, with longer duration trips leaving from the London Reception Centre, near to Waterloo train station. Departure points will be confirmed before booking a tour. Can I get picked up from my hotel? Pick up from hotels is not possible. You will need to make your own way to the departure point. However some tours do have a designated hotel departure, which you can stay in prior to the trip. Please ask at time of booking for departure points and we can direct you to local hotels. Entrance fees are included where specified on the itinerary. Can I pay in dollars? All tours are quoted and charged in pounds sterling, but you can pay using your local card and currency. We will debit the card in pounds sterling and your bank will use their exchange rate at that time to deduct the amount in your local currency. What time does the trip leave and return? Departure times will vary depending on the itinerary. European tours departing from London will usually leave between 05.00am and 07.00am. Multi day UK tours will leave between 06.00am and 07:30am. Day trips will depart between 07.00am and 09.00am. European and worldwide tours that start in an overseas city will have a welcome reception on day one of the tour which is usually around 18.00pm. Return times vary depending on the itinerary. All the full day coach tours should be finished by no later than 19.00pm, traffic permitting. The train tours return between 20.00pm and 22.00pm. Longer duration trips will return between 16.00pm and 19.00pm. All times will be confirmed at time of booking. Is this a definite/guaranteed departure? A definite departure is guaranteed to operate for that given departure date. A trip that is not yet designated a definite departure is not yet guaranteed to operate based on current booking numbers. If a trip and departure date you are interested in is not yet definite, do not let this discourage you from booking. The more paid passengers received, the odds of the trip operating increase. In the slim case that the operator withdraw a trip you are booked on due to a lack of numbers, you are entitled to a full refund of any funds already paid towards the tour, or if flexible with your time, we can move you onto another departure. Who travels on these tours, who else is booked? Whilst we can not confirm exactly who else is booked on a tour, we can guarantee you will be travelling with fellow liked minded travelers who share a passion for travel, fun, adventure and discovery. All tours will be run by English speaking guides and age ranges will vary. The beauty of taking a guided holiday is you’ll have the opportunity to meet and travel with people from all over the globe. Are transfers included from the airport? In general, if you are joining or departing your guided holiday on the first or last day, return transfers between the airport and hotel are included (excludes itineraries starting and/or ending in London). You’ll find specific information on the itinerary’s page. What optional excursions can I do and can I book them now? Optional experiences are available on some tours. These are activities that are not automatically included, but offered during your trip to enhance your travel experience. These are all bookable whilst on the tour via your tour guide/travel director. These are payable by cash or card.